"For all the buzz surrounding farmers' markets and CSAs, for all the popularity of Slow Food USA and its burgeoning local convivia (chapters), the vast majority of people in the U.S. remain priced out of the trend -- and many of them are unaware of the alternatives to industrial food...In a nation that has seen median wages stagnate for 30 years even as real estate and health-care costs ratchet up, it's no easy thing to ask low-income people to pay more for their food. At the same time, we can't rightfully ask small-scale organic farmers growing for nearby markets to charge less for their produce. They're competing against a highly consolidated, lavishly subsidized industrial food system -- and few of them are doing much better than just scraping by." 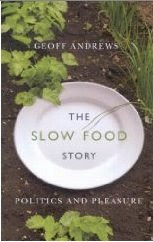 Geoff Andrews' book, The Slow Food Story: Politics and Pleasure, focuses on how Slow Food has grown into an international movement, such that its politics has matured, linking preservation with transformation, emphasizing tradition but challenging the status quo. Andrews points out that Slow Food is equally global and local, such that the specific geographic area where a chapter meets affects their approach. Indeed, we can say that Slow International has worked hard to embrace global food traditions and empower local food producers of all socio-economic backgrounds. The latest iteration of their mission is "Good, Clean, Fair," where good emphasizes the taste of the food, clean emphasizes local sustainable production, and fair means social justice for producers and consumers alike. One interesting place to look at how Slow is addressing these issues is in their support of foods of indigenous people. Winona LaDuke, writer, activist, and founder of the White Earth Land Recovery Project, claims that most of the foods in the Slow Food Ark of Taste, whereever they have migrated globally and culturally, are foods that were first used by Native Americans. Her own work on preserving wild rice and local biodiversity brought her the International Slow Food Award for the Defense of Biodiversity a few years ago. 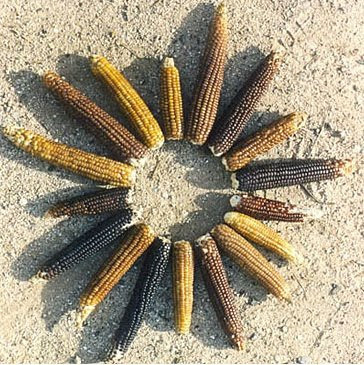 Slow Food is now focusing more of their support and funding for saving varieties like White Flint and Chapalote corn (also called Pinole Maiz, the first corn species to enter the US from Central America) and Iroquois corn, or Tuscarora, another heirloom variety. 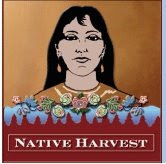 The Institute of the American Indian Arts, a four-year Tribal Arts and Land Grant College in Santa Fe, New Mexico has worked with Slow Food on heritage seed preservation. The Special Program on Native Foods/Culinary Arts Project helps revitalize the cultural knowledge and methods of growing and preparing food integral to Native American life. You can order indigenous food products from the White Earth Conservancy online catalogue, including maple candy, granola, hominy, strawberry and raspberry teas, buffalo sausage, and of course, wild rice. To grow your own indigenous corn, see High Mowing Seeds.